No one can resist the beauty and magnificence of twinkling stars at night. They are like golden creatures that dwell in the dark blue skies. Actually, they bring light and warmth to our cold and dark evenings. They are truly sentimental celestial bodies that all of us enjoy seeing at night. In line with that, to help you find the perfect star for your button designs, we have a list of star buttons that will definitely make your day sparkle. They are easy to download and are high-quality designs. They will surely give more meaning and glimmer to your ideas. If you’re interested, you can also check out our Glossy Buttons design templates on our website. Just click on the provided link to access them. According to Ian McNeil, a known historian and writer of the Encyclopedia of the History of Technology, the earliest known and recorded button was found in Mohenjodaro in the Indus Valley. It has a flat face and was made of a curved shell. It was said to be 5,000 years old already. Subsequently, it became famous in Rome together with other accessories such as buckles, brooches, and straight pins. The buttons also flourished during the medieval period because the use of buttons in one’s clothes meant money or conveys that you come from a wealthy family. During the thirteenth and fifteenth century, well-known designers used buttons to make the dresses of women more fit and in that case buttons made the clothes tight in all places. The button industry accelerated more during the Industrial Revolution. Moving forward to the current times, buttons are not just solely used for clothes but also for other purposes such as App Buttons. Indeed, the button has come a long way from just being a symbol of wealth. The dynamism of the button matches the sophistication of stars. Stars have been with the world since the beginning of time. They have been giving light and beauty to the universe in all aspects. As you can see, the buttons we offer do not just focus on a particular aspect or theme or design. 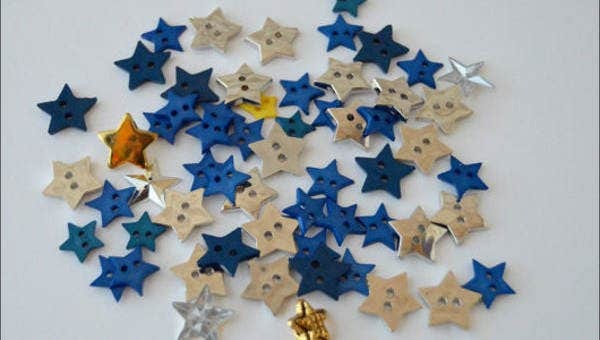 If you fancy vintage designs, you can use our gold star buttons for your clothes. Most of the designs are modern ones. They tend to portray various color schemes. As a geometrical shape, there are also some technicalities in dealing with them. Designers also take effort to elevate them in order to broaden their uses and give more options to the public rather than sticking to ordinary designs. As we all know, color schemes used also play a key role. Our buttons will also help you with this because we do not just offer vibrant and colorful star buttons but also the metallic designs. The type of designs used will really depend on the concept behind your work. Make sure that everything is in harmony with one another. So what are you waiting for? Start downloading and use them to put your designs to greater heights. You can also check out our Social Media Buttons.